Denney Aerocraft produced the first Kitfox kit in November of 1984 in a small factory in Boise, Idaho. The Kitfox was designed as a lightweight, two-place sport aircraft with excellent STOL (Short Takeoff and Landing) performance and the ability to operate from short and unimproved airfields. The Kitfox features folding wings and is easily trailered, allowing owners to share hangar space or keep their Kitfox's at home in a single car garage. 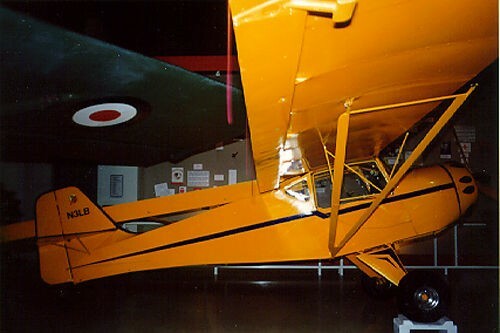 Six Model 1 Kitfox's were delivered that first year. Since 1984, over 4,000 Kitfox kits have been delivered to builders throughout the United States, Canada, and over 42 foreign countries. In June 1992, SkyStar Aircraft Corporation, under the direction of Phil Reed, purchased the rights to produce the Kitfox kit from Denney Aerocraft. In January of 2000, an employee group acquired SkyStar Aircraft. The Kitfox Model 1 introduced the nostalgic “bump” cowl that has become the signature of the Kitfox. This cowl design was originally intended to accommodate a small radial engine, but the engine intended for the Kitfox never matured. The “round engine” look was retained, and remains popular today. The compact Model 1 had an empty weight of only 425 pounds, and a gross weight of 850 pounds. The Rotax 532 was the engine of choice, although other two-stroke engines have been used. From a flying standpoint, the Kitfox Model 1 would be called an ultralight by today’s standards. It is a very simple, basic airplane that is light weight and relatively high powered (usually 65 HP). The interior can best be described as “cozy,” and the aircraft was usually built without dual brakes. The Model 1 accelerates rapidly and has light ailerons. There is a good deal of adverse yaw coupled with a neutral yaw axis. The adverse yaw is easily taken care of with rudder, but the rudder feel is different than most contemporary airplanes. Basically, if you push the rudder to yaw the plane, it will stay yawed. You may have to physically move the rudder to bring the nose back to the centre. It takes time to adapt to this characteristic, but it is easily learned. The flaperons may be moved as flaps to affect pitch trim and lower the stall speed. Lowering the flaperons to more than 2/3 of their full travel will result in up to a 50% reduction in roll rate. Takeoffs and landings are quite normal for a tailwheel airplane and easier than most. The nose fuel tank keeps most of the mass (centre of gravity) right along the centreline, and directional control is not a major challenge.